Good morning, readers! I can’t tell you how lovely it is to be back home, stateside. I’ve got some lovely things planned for you this week, but I thought I’d start our day off with a special vendor spotlight on one of our Grey Likes Vendors, Tie That Binds. 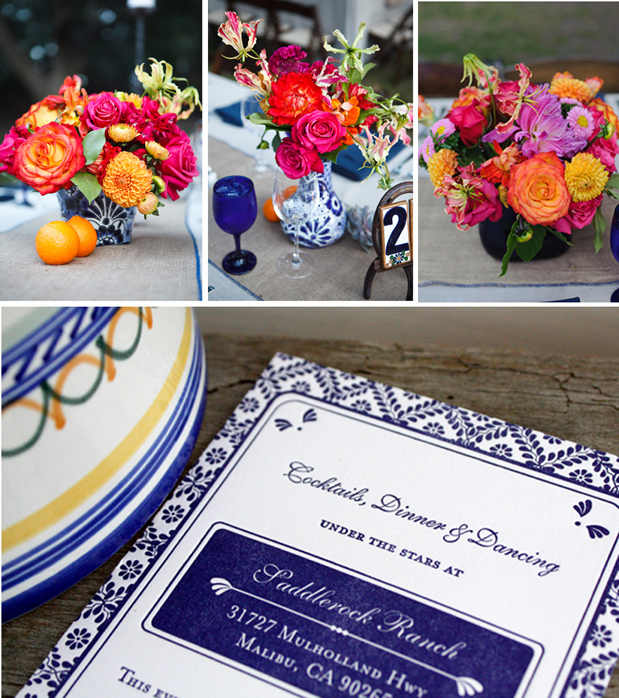 Owner/Designer Mekala Tinnin specializes in paper styling, which means that she lives for the opportunity to help pull together all of the elements from your wedding with the use of custom designed stationery. But nothing can show her work better than a real wedding, right? Well, lucky us. Mekala has sent over a gorgeous “Old Spanish Romance on the Ranch” wedding that couldn’t be a more perfect example of how Tie That Binds crafts a lovely story with paper. Alongside the images we’ve included some info from the bride, as well as vendor resources below! To see more images and a full gallery click here. I hope you enjoy! I have always been drawn to the old Spanish/Mexican elegance, and knew I wanted to incorporate part of our heritage and culture in the wedding. 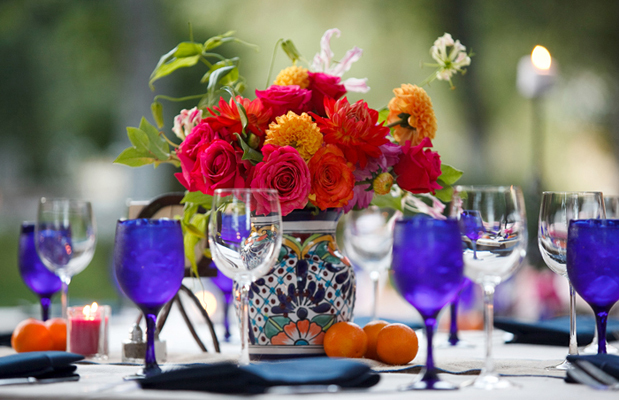 I love the Diego Rivera/Frida Khalo era and decided to include some details that fit in with a simple, yet romantic and elegant Spanish/Mexican affair that didn’t scream cheesy Mexican fiesta. To reflect this theme we decided on a dark cobalt/navy blue, shades of tan, and vibrant pops of fuchsia and other lively colors. I wanted to be as authentic as possible with the décor for the wedding, and I knew that trying to buy original and handcrafted Mexican items from L.A. would be either too expensive or extremely difficult. So instead I found a cheap ticket and flew into Guadalajara, Mexico for a weekend to go scavenger hunting with my relatives who live there. I went directly to the city where they hand-painted talavera ceramics and blown glass pieces are manufactured, and negotiated directly with the artisans. 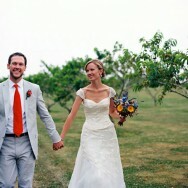 Our wedding ceremony was held at the chapel at LMU, where I went to school both for my undergrad and grad degrees. Having the privilege as an alum to get married in this gorgeous chapel, and to have my very first professor and mentor at LMU officiate our ceremony, was extremely special. Choosing an outdoor venue that fit both the look of the wedding that I was aiming for and that spoke to who we are (traveling wine and animal lovers who enjoy the outdoors) I thought would be difficult, that is until the gates of Saddlerock Ranch in Malibu opened and we drove into a place that is sort of a world all on its own. 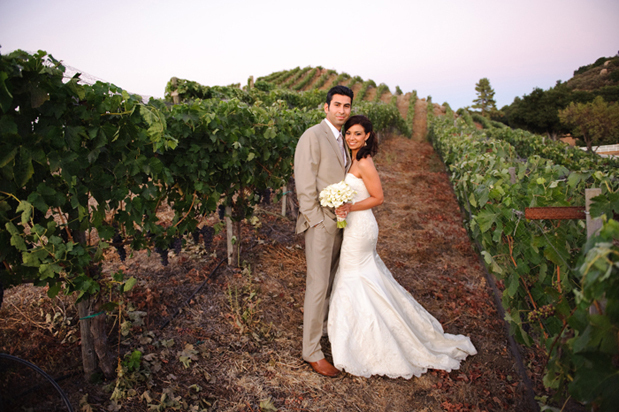 It was the best of both worlds: large manicured lawns, oak trees, rolling hillsides covered with vineyards, and did I mention the exotic animals? Zebras, camels, and buffalo, Oh my! This was the first and only venue we physically looked at, and knew instantly that this was the perfect place for us. For the cocktail reception we wanted to keep the décor to a minimum so that our guests could simply enjoy the charm and beauty of Saddlerock Ranch. We used hay bales and old wine barrels that we rented from the ranch. In addition to providing a delicious Spanish infused menu, Contemporary Catering also provided carrots and apples for our guests to feed the animals during the cocktail hour. 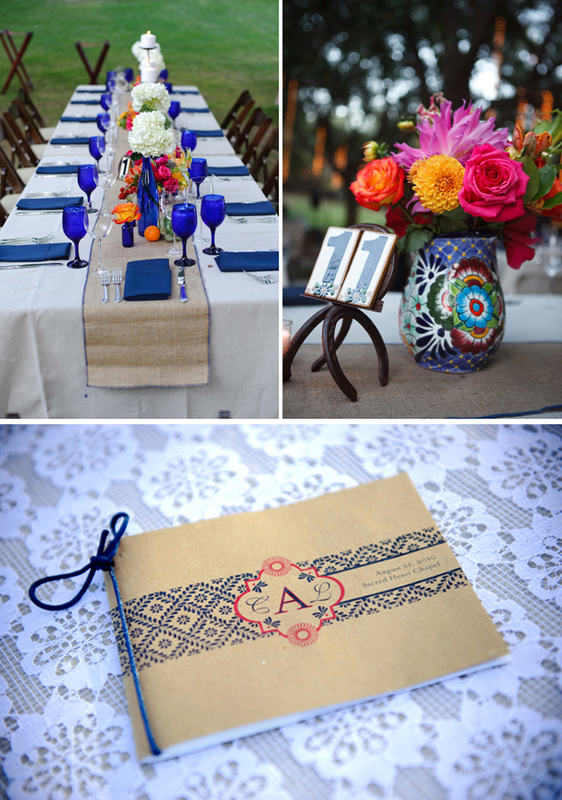 For the reception we used a mixture of hand painted talavera pottery and cobalt blown glass pieces for the floral centerpiece arrangements; I purchased Mexican tiles for the table numbers and matching hand painted clay bells that also had our initials and wedding date to double as favors and guest seating cards. I bought hand crafted tin stars from Mexico in various designs and sizes to hang over the dance floor, in lieu of renting chandeliers. 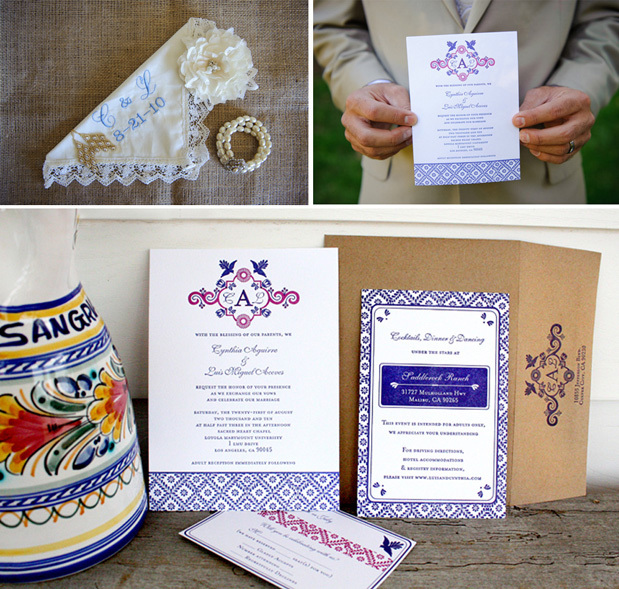 Drawing from the designs found on talavera pottery, Mekala at Tie That Binds created a custom suite of gorgeous letterpressed invites. Mekala was able to capture and conceptualize our theme beautifully and created a unique design that stood out in a subtle yet elegant way. She carried this design throughout our stationery elements for the buffet table menus, custom drink list, dessert table, favor tags, ceremony programs, and guest sign-in cards. Since we chose to serve our favorite desserts instead of the traditional wedding cake, we had a small cake made and used the border detail and monogram design from our invites to decorate the cake as well. Executing a seamless day and ensuring that all of our hard work paid off was all thanks to Angel and her team at Events of Love and Splendor. 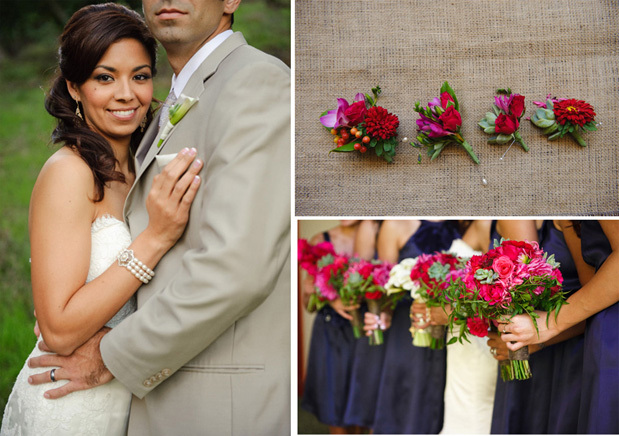 I knew even before diving into wedding planning that I was going to need someone who was reliable, super detail oriented, and had a fantastic sense of style and creativity. She was one of the first vendors we booked and I was so blessed to have her on board as a central part of the amazing vendor team we worked with. I can’t say I have only one. It’s hard to pick, from my mom’s reaction to when I gave her the photo book I made for her from one of my dress fittings (photos courtesy of our fabulous photographer); to when my dad walked in to our hotel room and teared up when he saw me all dressed up in my gown; to when the doors opened at the church… the church I had been to many times before as a student and staff and now taking the walk down the aisle as a bride towards the man I would spend the rest of my life with; getting roasted by my brother/the best man; when I surprised my husband and sang “Love Song” to him, accompanied by our Spanish guitar trio; or our walk alone around the silent ranch after everyone had left and visiting the camel “ET” at 2am before heading to our hotel. The whole day was a day I will never forget and even months later I am still hearing people rave about what a beautiful, personal, and fun wedding it was. these rich, rich colors are so amazing! I can't tell you how many times I've fallen in love with blue and white pottery. Every time I see it, it's arranged differently and paired with completely unique floral arrangements. I actually inherited my Grammie's blue and white china dishes so now I'm on the hunt for some bright flowers to go with them! Thanks for the inspiration! this is so gorgeous! 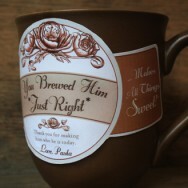 I'm doing a wedding with similar pottery this year... I can't wait. 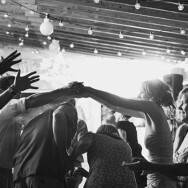 I had a blast shooting this wedding! Thank you to all the vendors that made this event extra special and thank you for sharing it on your blog! I loooove the talavera vases. Does anyone know where I can get some for my wedding? !